On their website, Lain Percussion describes the Professional Maraca as the “most imitated maracas around,” and I’m sure they’re correct. I feel like I’ve seen a pair of these ubiquitous yellow shakers (or one of their apparent facsimiles) in every practice room or high school music class in which I’ve ever set foot. However, while I’ve spent plenty of time with the Pro Maracas, I’d never actually owned a pair until very recently. I needed a shaker that wouldn’t have trouble going from loud to soft very easily, and I didn’t have a ton of money to spend. After trying a number of different models at several stores around town, I finally settled on the Pro Maracas. At under twenty dollars, they were hard to ignore. Having played them now for several weeks, I feel like I made a pretty good decision. The Professional Maracas have a very durable plastic housing and a comfortably carved wooden handle that feels good in hand (a little too large to do the Jim Keltner thing comfortably though). I’m totally incapable of keeping nice things, and as such, I’ve already drop the maracas many times. Fortunately, there are virtually no signs of damage, and I feel pretty comfortable that they’ll hold up no matter what I do. Concerning their sound, the Professional Maracas are more than capable of handling loud situations. I’ve used them at a few rehearsals, and they had no problem cutting through a big messy wall of electric guitar. However, I found them a little more difficult to control at lower volumes. The sharp, bright tone is perhaps a bit too brash for truly quiet playing. That said, the Pro Maracas weren’t designed for very low volume play, and LP has a large selection of maracas and shakers for players with more dynamic needs. Beyond the basics of sound and feel, there are two features about the LP Professional Maracas that warrant special mention. First, the set includes both high and low pitched shakers to help create the traditional maraca pattern. The difference in timbre isn’t overwhelming, but it’s definitely noticeable. Nice touch. 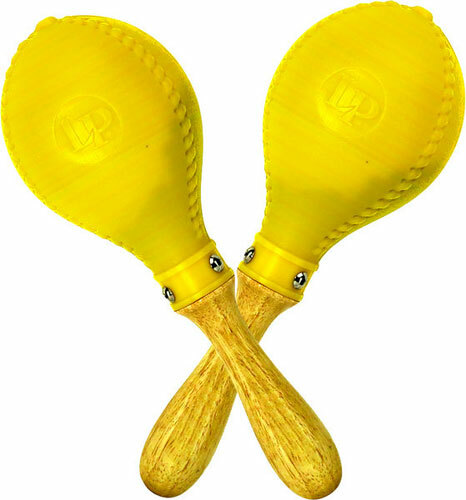 Additionally, I found that gripping the maracas near the base of the yellow bulb dramatically cuts down on the attack (as well as improving the control) of each stroke. With a little practice, this became an easy way to bring the volume down a bit. On the whole, the LP Professional Maracas are a great investment for anyone looking for a capable shaker. And again, priced at less than twenty bucks, it’s hard to say no. Considering how useful the Professional model has been, I’m eager to check out more of what LP has to offer. As evidenced by the video below, I still need plenty of practice with the maracas, but I hope the clip gives a little insight into how they can be applied to the drum set. This is wonderful, I do great, and I did not no it. I still need Practice,Will you help me?